Here is a small collage of just some of the magnificent pieces showcased in the family’s shop. You can peruse just a handful of Viktor’s offerings in his Etsy shop, or find him on the Filigran Split Facebook page. We were utterly amazed at the hundreds of custom designs that Viktor’s created in the last five decades. He said that he’s also happy to custom-design work based on a customer’s sketch too. If you’re lucky enough to be visiting Split, drop by the Čivljak’s shop, Filigran Split, located at Bosanska 4. It’s just a few seconds’ walk from Pjaca (Narodni Trg Square), and less than a minute from the Iron Gate of Diocletian’s Palace. If you’ll be staying in Split for a few days, you might be interested in the Split Card, which gives you free entry to certain museums and galleries, and reduced rates to others. Back in 2014, guests staying in Split for 3 days or more could pick up the Split Card for free, but as of 2016, there is a fee to purchase the card. The link above details the current cost, as well as the participating museums and businesses. Need more inspiration as you plan your excursions in Split and beyond? This link contains an index of all my posts from Croatia. Jewelry design © Viktor Čivljak, Filigran Split, Bosanska 4, Split, Croatia. Fitting adjectives to describe Viktor’s work, Virginia. I’m looking forward to showing the detailed process behind his masterpieces in the coming weeks. It’s incredible to me that he’s created so much beauty in his little workroom, under the glow of a single fluorescent light bulb. He’s an artist whose medium is silver thread. Beautiful! Hi Patty, nice to connect again! That ring sure is a beauty, with its elongated design. I think the artist lightly puts the jewelry under the flame to obtain that warm patina. To get that lovely patina, I think Viktor lightly placed ‘your’ favorite pendant under the fire, just for a brief second. Otherwise, the silver comes out with more of a white glow until it’s exposed to the air for some time. Thanks, Tricia :) Have a lovely day! Love that romantic flair and old-world charm of this jewelry. Annette, me too. The couple told us (through a translator) that people purchase their jewelry to complement traditional styles and newer ones too. For example, each year here in Sinj, Croatia, there’s a re-enactment during which actors commemorate a victory over the Ottoman Turks. This jeweler makes buttons for the participants’ traditional costumes. On the other hand, they’ve also made these toka (silver balls) for grooms to wear in place of a tie at a wedding, something that’s considered to be a newer interpretation. An interesting blend of old & new! What a beautiful detailed art work, I can sense some middle eastern influence in her design. Thank you for sharing Tricia! Cornelia, I see what you mean about some Middle-Eastern elements in Viktor’s designs. When I was in Sarajevo several years ago, I recall seeing earrings with similar motifs. The mixture of different cultures in the Balkans is indeed fascinating. Such a complex history here. These are lovely and I can imagine how much time goes into their creation. Did you buy any Tricia? Carol, belated greetings following a broken computer and time on the road. :) Yes, I am now the happy owner of a beautiful pair of earrings. There’s a story behind them. We’d approached this couple and asked them to document the jewelry-making process in their shop. They said yes, and after our afternoon together was over, they insisted on giving me the exact pair of earrings we’d watched being made. Of course, I’ll always treasure them. Coincidentally, we’re working on the video and step-by-step blog post right now showing how Viktor works his magic in silver. We’re hoping to have them published in the coming days. I’m looking forward to reading all about it. Lucky you! Lucky indeed, Carol. I’ll always treasure those earrings, knowing how much work goes into making them. Very nice pieces Tricia, I wouldn’t get my wife out of there. Mark, we won’t tell her that this jeweler has an online Etsy store then. :) Looks like you had a wonderful getaway in the Caribbean. Your site has really evolved. As always I enjoy your photos and the informative posts. All the best. That’s nice of you to say, Viktor. I love the process and so it’s fun trying to put different creative spins on things from time to time. Are you back in NY now, following your time in Saudi Arabia? What an adventure that must have been! Cris, we’ll soon be sharing another tale about jeweler Viktor’s incredible work with a step-by-step post. It’s as if he’s spinning masterpieces out of silver thread! Gorgeous! 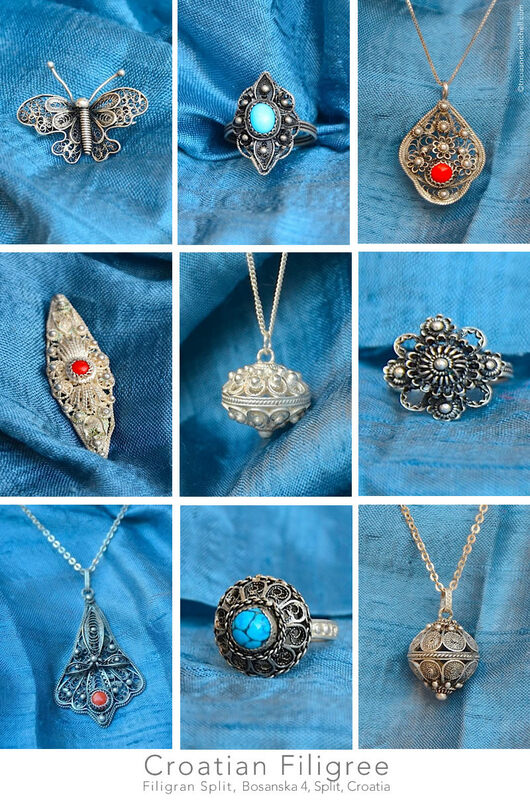 The jewellery and the blog. :). That butterfly particularly appeals to me. Thank you, Rachael. If we were still in Split, I’d share your praise with jeweler Viktor. I think it would bring a smile to his face. Viktor’s wife, Flora, mentioned that the butterfly brooch is one of the more popular items among the locals. I think the wing detail especially shows off Viktor’s delicate work. Speaking of filigree, we’re currently working on a video & blog post showing step by step how Viktor creates such masterpieces. We’re hoping to have it up in the coming days. Shawn’s video does the process the most justice since it shows the pieces under the flame, and Viktor in action.